You know how a slice of cake with just one layer is good...two layers is really good...three layers is even better...but 4 layers are scrumptious! 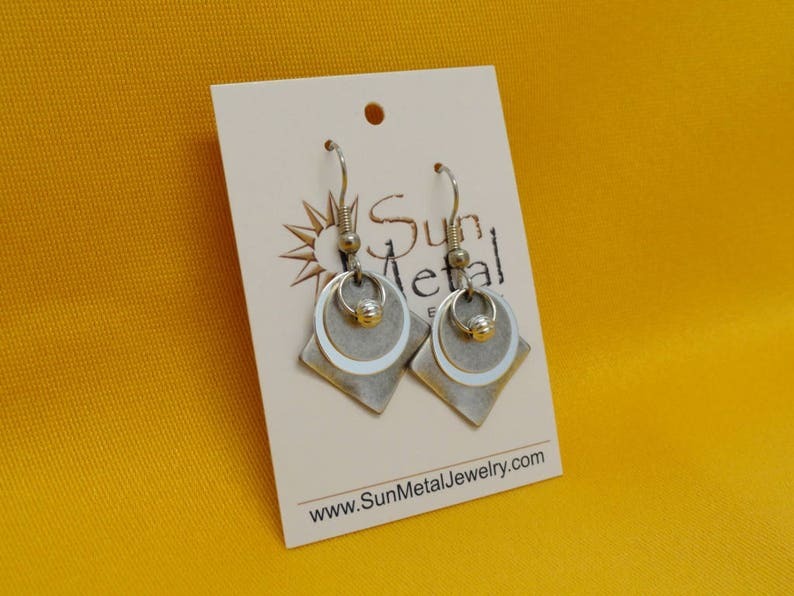 Well these earrings have 4 yummy layers of mixed metals - a ribbed silver bead on a ring over a small antique silver disc over a bigger shiny silver disc over a gorgeous antique silver diagonal square. They hang together from a surgical steel earwire. Delicious! This earring is also available in other flavors! From the top of the earwire this earrings is 1-5/8" long and 3/4" across. This earring is also available in other flavors! Granddaughter loved these earring for her birthday. Told me she wants me to continue buying jewelry from Sun Metal for her at Christmas and birthday's.